Pissarro was the eldest son of the Impressionist artist Camille Pissarro and had little formal training but painted with his father and briefly studied wood-engraving. In 1886 he participated in the eighth and last Impressionist exhibition. He was one of the first to join the Neo-Impressionist movement and exhibited at the first Salon des Indépendants. Pissarro moved to London in 1890 and established important artistic contacts. He became a British citizen in 1916, but spent several months of each year in France. He founded the Eragny Press in 1894, co-founded the Camden Town Group and was a founding member of The London Group. 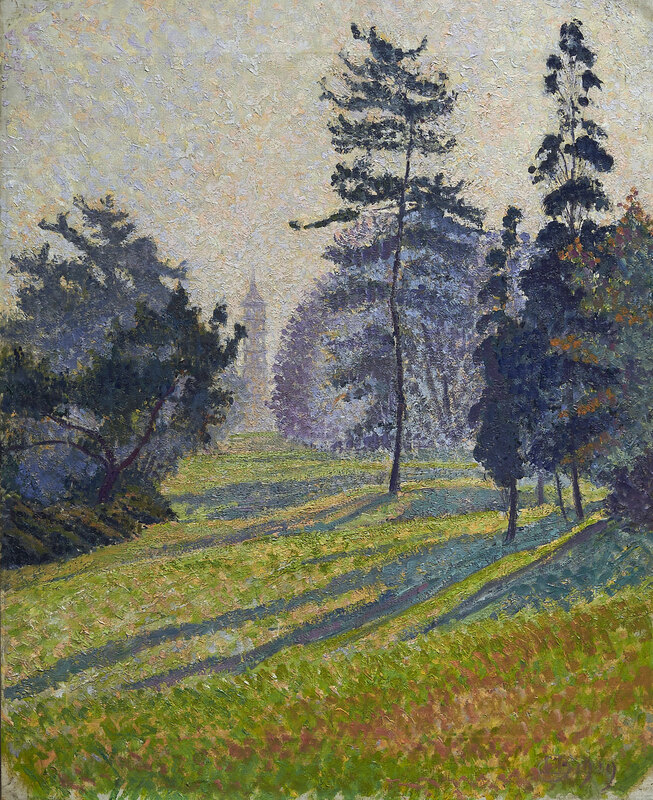 The dappled paint and use of light and shade reflects Pissarro’s Impressionistic roots in this artful view of the famous Pagoda in London’s Kew Gardens. The long shadows and stippling of orange suggest that day is lengthening into evening and the park has emptied of figures.